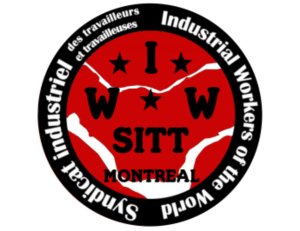 SITT-IWW | Law 25 on welfare : a war on the poor! Law 25 on welfare : a war on the poor! On April 1 came into force the law 25 – "An Act to provide a better match between training and employment and to promote employment integration" – which was integrated with the current law on social assistance. We believe it is the early termination of welfare because the founding principles behind it, the right to live decently and access to income regardless of the cause of need, no longer considered. Its implementation will jeopardize people's lives by imposing attempt to survive them with crumbs, and taking in the great objective employment project, whose purpose is to provide a cheap labor business. The law 25 implies that, when you find yourself in these categories, if one misses a meeting with our officer or social welfare officer, she or he can retain completely our check. Furthermore, in case of breach of any of our obligations without cause "valid" (according to the plan set by the welfare officer-e corresponding to our situation : making employment initiatives, to training or to "develop social skills"), Agent-e will have the right to cut our check in the following month or the following month. Basically, if we refuse to comply with employment integration program, we are forced to live with a check 409$ per month. It is therefore clear that the objective of the law 25 is to require persons found no compulsion to work to find one, according to the priorities of private enterprise and according to labor market needs (and conditions established by the welfare officer-e). But we know that the work is not the only way to achieve in life ! And we claim the right to live decently no matter how it is done. In the facts, this law reinforces the notion of "good and bad poor" and prejudice against people who do not have jobs. The government amplifies voluntarily. It is to his advantage to do so, breaking the solidarity among the population, sparking discontent against welfare recipients who have "easy", that are "hard fat, parasites, fraudsters, profiteers "who deserve to live in misery. The irony is that even the Employers Council has expressed reservations about the punitive measures Objective employment program. By parliamentary committee, M. Yves-Thomas Dorval, CEO of the Quebec Employers Council, said : « […] That said, I'll be honest with you, M. The Minister : The amount of social assistance, was, it's not much either, […]. That's why I was very happy to see that enhances Russia welfare for those who want to participate. And with that I can assure you of our full support in that direction. Now, it is difficult for a government to make measurements without consideration. And that, I do not know if this is the best, we are not experts in it, but I can just tell you : For sure this is already not high, was, the level of social assistance.» (27 January 2016). The government's goal is clear : He wishes discipline the poor world to make it a slave labor and captive, no alternative but to actively participate in programs imposed by the Ministry not to starve. What is announced, this is not a fight against poverty, it is a war to the poor! Keeping us in abject conditions, stirring a core in the form of possible adjustments on their check and a stick in the form of large denomination check or file closure, the Liberal party is a cheap labor, Gift for the company, and long-term, the end of welfare.